From my own historical readings, I know that Kansas raises some corn, a lot of cattle, maize, and a few other things. 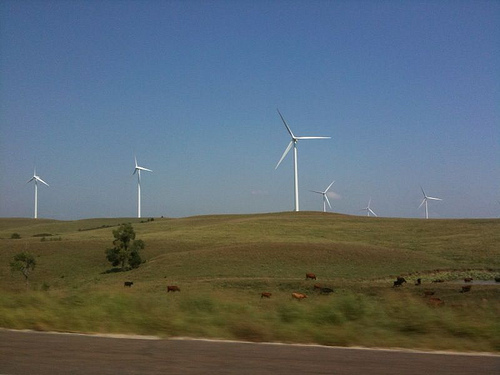 Until yesterday, I forgot that Kansas also raises electricity at its wind farms. We passed by the largest wind farm in Kansas just outside of Salina on our #PDXbound trek. Turbine after turbine on top of small rolling hills for miles. Facing not in uniform direction, some of the turbines looked as if they were grouped in conversation. Massive, we could see them for miles before we were actually near. For years while in West Virginia, I had watched as one at a time these huge blades were transported west on I70 on elongated tractor trailer trucks. One at a time, "Oversided Load" posted on their bumpers, westward ho went the turbine blades. I marveled at their size and wondered at engineers who designed and contractors who built such big machines. Now I know where the blades went. 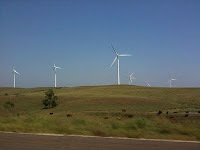 Over 150 wind turbines (of two makes) sprinkle 25,000 acres here in the middle of Kansas, providing lots of electricity. (I don't understand electrical units.) The Smoky Hills project allows the landowners to collect royalties, the utility companies to collect payments for electricity provided, and for us to gain a little less dependence on fossil fuels. When Tim connected our electricity for the apartment in Portland, he had a choice of paying a tiny bit more to make sure our electricity comes - as much as possible - from wind farms such as these. As I gaped in awe driving past these elegant, giant pinwheels, I thanked God for wind. I gave thanks for the very breath of God that blows over creation giving us all that we need. Maggie, we drive west on I-70 at least once a year to visit Norm's family in Colby. The first time we came upon this huge wind farm, it was a darkly cloudy sky in the west and the sun was hitting the blades at a low angle from the east. The effect was something like the painting "View of Toledo" by El Greco. It took a while to realize that the apparitions were windmills. Now I know how Don Quixote felt when the thought they were knights on horseback he needed to fight with. It is amazing to drive by them--I have never seen them moving fast, even in a strong wind. I think they are geared that way. Like you, grateful for wind power and hoping it is situated so as not to harm the migrating and resident wildlife.